The Bear Naked brand has been around since 2002. You might already be familiar with their modest-size bags of boutique granolas. Their granolas are quality products, but they've always been priced too high for the average cereal consumer. 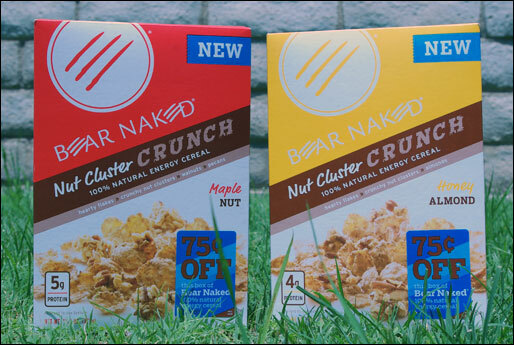 This is the first time that Bear Naked has given us a boxed product at a reasonable price... and it's about time. I tried two varieties: Honey Almond & Maple Nut. I liked them both. The cereals consist of crunchy, hearty flakes that maintain their crunch for several minutes after being doused with milk. Flake-sized clusters of oats and nuts offer an additional lighter crunch and some variety in texture from spoonful to spoonful. 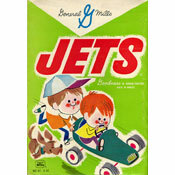 As for flavor, I preferred the honey almond variety. The maple nut version has just the slightest burnt-maple undertone. Both cereals taste familiar. They're not doing anything new, but they are doing something right. These cereals are tasty, crunchy and satisfying. Give 'em a try. I think you'll like them. Each 3/4 cup serving has 180 calories, 1.5 grams fat (0 saturated and 0 trans), 0 mg cholesterol, 40 grams total carbs, 3 grams dietary fiber, 11 grams sugar and 4 grams protein. Each 1 cup serving has 220 calories, 2 grams fat (0 saturated and 0 trans), 0 mg cholesterol, 49 grams total carbs, 4 grams dietary fiber, 13 grams sugar and 5 grams protein. 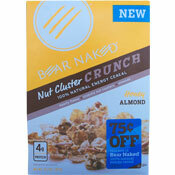 What do you think of Nut Cluster Crunch Cereals? Not very good. Taste like cheap cereal only worse. Could not find any "nut" clusters. Just hard pieces that nearly chipped my teeth. Way overpriced. Box looks big from the front, but the box is so thin from the side and the cardboard is so flimsy it collapses when you grasp it.